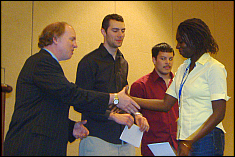 Four student teams, from the University of Maryland College Park, participated in the light wing competition at the 2007 SAMPE International Conference. The University of Maryland's CORE lab team placed 3rd in the overall competition. They were also the best placed team from the University Maryland College Park. The 2007 SAMPE International Conference was held in Baltimore, MD from June 3rd to June 7th. The competition consisted of designing a wing within precise constraints specified by the contest rules. With a given cross section and a weight limit, the wing entirely made of real composite materials was tested by setting a reacting fixture at wing ends and applying a load at the wing center. Please join us in congratulating CORE team, our faculty advisors ( Dr. Pavlin and Dr. Wereley), and all four of the University of Maryland teams that participated in the 2007 SAMPE INTERNATIONAL Conference in Baltimore.